Holy Angels players celebrate one of their seven goals Thursday night (Photo by Tim Kolehmainen). 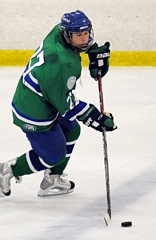 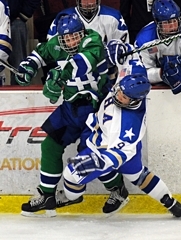 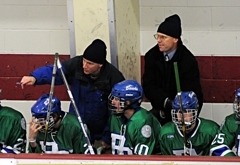 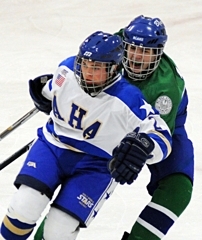 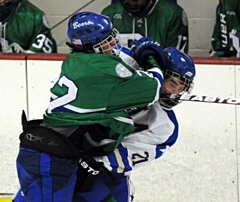 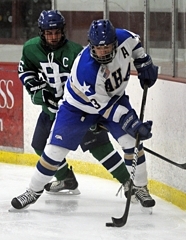 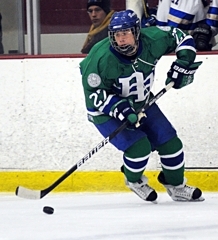 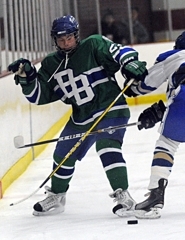 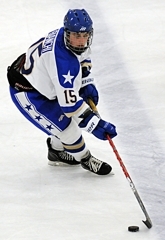 Joseph LaBate scored four goals, including a natural hat trick to kick off the game, as Holy Angels cruised to a 7-0 victory over Blake in the semifinals of the Schwan Cup Silver Division at the Super Rink in Blaine. 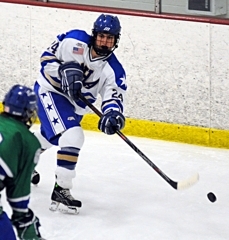 LaBate and the Stars (3-2-0) jumped on the Bears (5-1-2) early, scoring a pair of goals in the first three minutes. 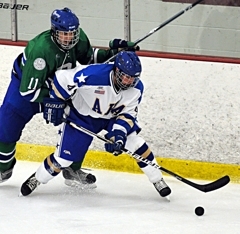 Holy Angels led 4-0 after the first period and 7-0 after two, sending the game to running time for the entire third period. 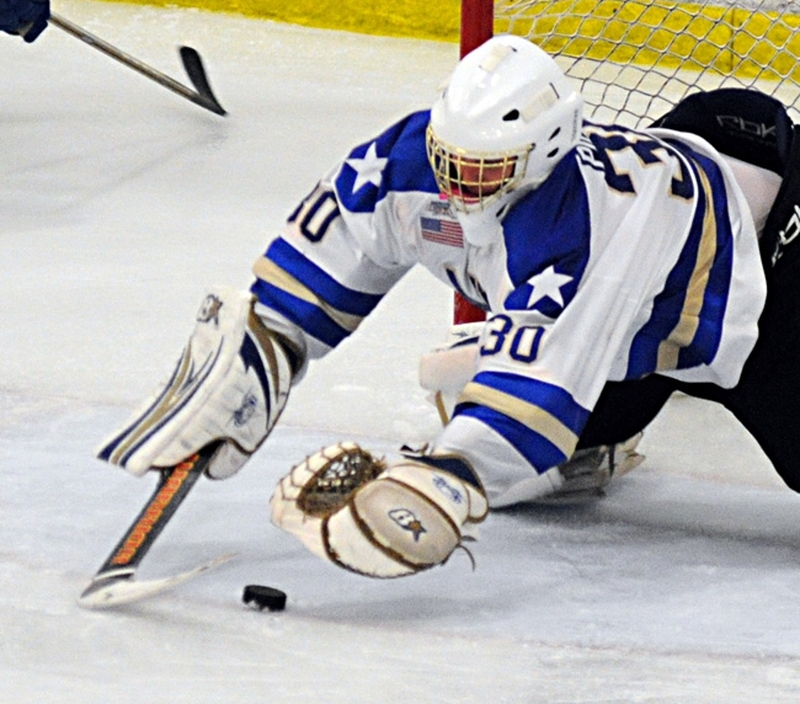 Stars' goaltender Brett Pierce had a shutout between the pipes, stopping all 19 shots. 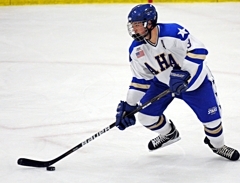 Holy Angels advances to the championship game at 5:30 p.m. Saturday, Jan. 1 against Cretin-Derham Hall. 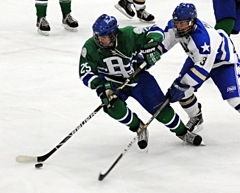 Blake plays Stillwater in the third place game Friday. 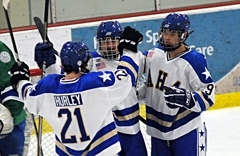 Please check back tomorrow for a full story, as the results were not available after the game due to a computer scoring error. 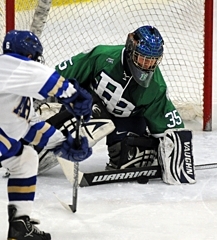 Holy Angels goalie Brett Pierce dives on a loose puck (Photo by Tim Kolehmainen).